And when I say easy, I mean you don't need any artistic skills to create something that's really nice (and is guaranteed to fit in with your interior decor because you'll be the one choosing the colour palette!). Don't believe me? See below for four super simple ways to dress up your walls that require no drawing skills and that you'll be able to complete in under half an hour! Flip over your paint chips and trace shapes onto the back using your cookie cutters as a guide. I worked with three shapes - a triangle, a circle and a small rectangle. Cut out each of the shapes you traced with a pair of scissors. If your large sheet of coloured card isn't yet cut to size (mine came in a big roll), trim it so that it'll fit the frame you'll be using to show off your artwork. Then place your shapes on the coloured card in whichever arrangement you like best. I used paint chips in black and white against purple card, but you can go nuts with as many coloured paint chips as you like! Once you're happy with your arrangement, flip one of the shapes over, apply double-sided tape or glue to the back, then stick it back down. Repeat this with all the shapes in your artwork until they're safely stuck in place. If some of your shapes were stuck down with edges that came off the coloured card, trim off the excess with a pair of scissors. Dress this one up with a nice frame and hang on your wall for a very modern, fun looking art piece. Place strips of painter's tape on your canvas in whichever arrangment takes your fancy. There are no rules here - I went for a very straight striped look, but you can put the tape at angles, in shapes or whatever you prefer. Make sure the tape is well stuck down, then paint in the segments with acrylic paint. Don't be afraid to get creative - the number of colors you choose and the order they go in is entirely up to you and can totally change the look of the finished piece! Once you've painted in all the sections and the paint has completely dried, remove the painter's tape to reveal your finished artwork. This method of creating wall art is so simple that you could easily knock over several of these in an afternoon. And having three or more of these little color-blocked canvases hung in a row would look really good don't you think? Place your circle stickers in random spots over your canvas. I started sticking them at the bottom in clumps and then placed them more sparingly at the top for that 'floating bubbles' kind of look. 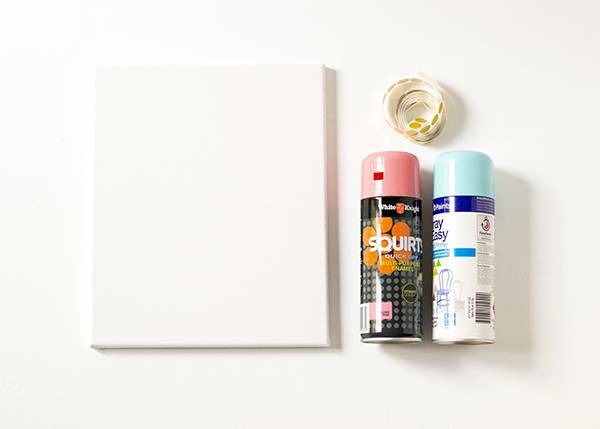 Choose one colour of spray paint and completely coat your canvas in that colour. When spraying, make sure you use multiple, light, even coats rather than one heavy coat - this way, the paint won't pool and drip. Once your first colour of spray paint is dry, start spraying the second colour on. The trick to getting a gradient look is to start from the bottom of the canvas and work your way upwards. Make sure you spray from further away so that the second colour is a light mist rather than a heavy coat. When the second spray paint colour has dried, peel off the circle stickers to reveal white dots underneath. I love how airy and light the pastel colours and the white 'bubbles' look together, but don't be restricted by this example - I think this concept would look just as good or even better with different shapes (diamonds perhaps?) and heavier colours like black and gold! Measure and cut a small square out of your foam sheet. Mine measured 5cm x 5cm but you can make it pretty much any size you like, depending on how you'd like your final artwork to look. Cut your foam square in half diagonally to form two triangles. Cut one of the triangles into strips (you can draw the strips out in pencil first like I did if you want to make sure they're even). Place a bit of craft glue on the back of each foam strip and attach it to your stamp mount to recreate your triangle shape. Leave a gap between each strip so your triangle has a 'cut-apart' jagged sort of appearance. You can buy proper wood stamp mounts from craft stores but don't worry if you can't find one - just use something that you can easily hold and stamp with instead, like a small cardboard box lid or a jar lid. With a foam paintbrush, apply acrylic paint to your foam stamp. When the stamp is evenly covered with paint, place it face down on your piece of paper and apply even pressure to the back. Then lift it up to reveal your print! Randomly stamp triangles all over your sheet of paper. I found it easiest to complete one colour before moving onto the next - it saves having to clean the foam brush so frequently! Once you've stamped triangles in all your paint colours, your artwork is complete! Simply let it dry and then pop it in a nice frame.